Last month, I was told about a group of pilots performing for a charity event in Second Life, the KT Festival raising funds for Worldwish.org. 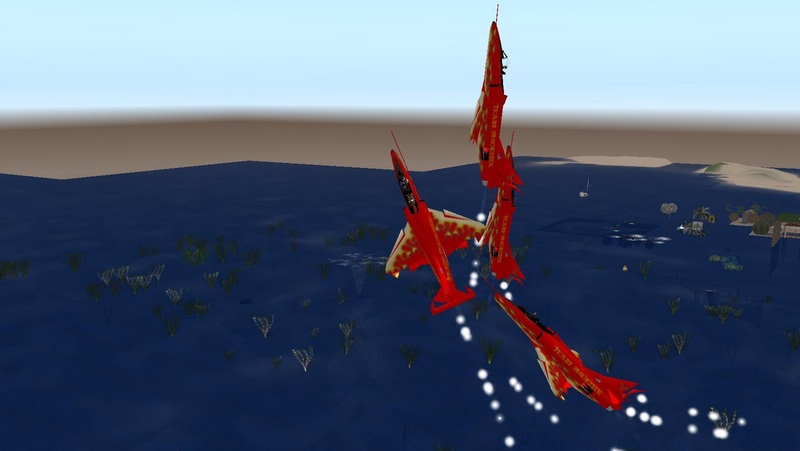 This was the Phoenix Squadron. Unfortunetly, I couldn't make the event. But I did meet up with one of the fliers shortly afterward, May Silvercloud. 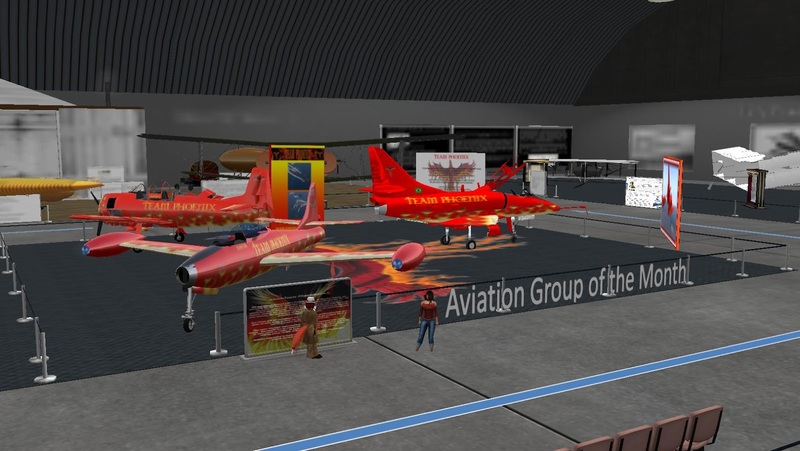 Meeting up at the museum area at Baitoushan International Airport (164, 180, 3001), she showed me three planes of theirs, a WW2 torpedo bomber, a 1940s "Shooting Star" jet, and a Vietnam War-era fighter-bomber, all painted crimson red, "This is our display. We are the group of the month for December." I asked about the name, and May answered, "Well, some of the team were members of another, called the Moths. 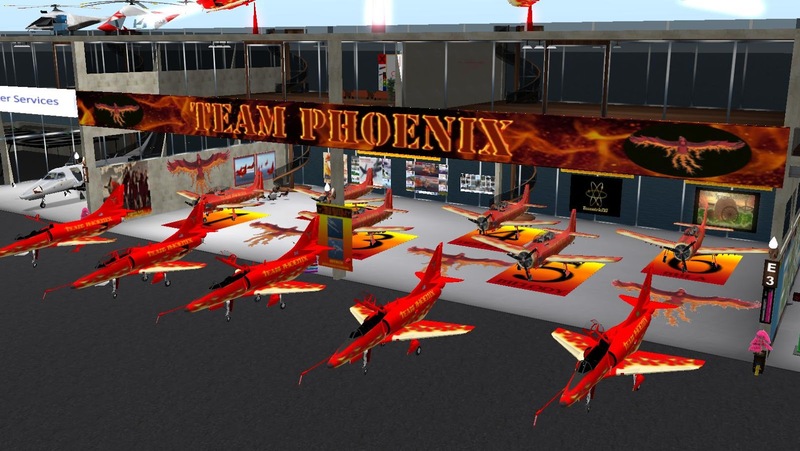 And when that team disbanded, we rose like a Phoenix, and formed Team Phoenix." She stated the team has three Americans, two Britishers, and one Brazilian for the pilots, as well as a DJ and announcer, "We train twice a week when we don't have a show, and the week of a show we will train everyday beforehand." 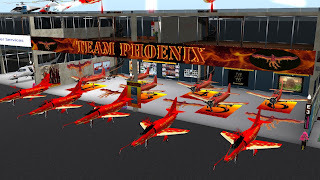 There was no association with the Firestorm Development Team, which used to be called the Phoenix Development Team in it's earlier days, though there was a Phoenix airport that they later based at. Besides the KT Festival, they had taken part in other events. Probably the most memorable, "would have to be one we did for Willow Spring Horse Auction place.They were having an event for Relay for Life. The sim was packed and the lag was really bad. But we stuck to our plan, and it turned out great." But as they had taken part in larger air shows and times with other teams, others might have a different idea. Of Second Life's flight squadron's she called Phoenix, "one of the most varied of all the teams ... the variety of maneuvers we fly (and) we fly very close, and also keep formation. Other teams spread themselves more, which (in our opinion) distracts the viewer from the team, focuses on individuals rather than the team. And Phoenix is all about the team." 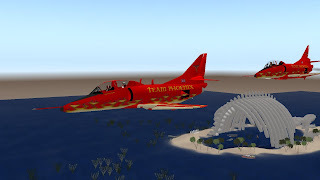 She told me the team would be meeting up on Sunday, and some days later I dropped by where they were at the SecondLife International Airport at the Antilaghi (244/189/24). The four others besides May were Mr. Pilot Sinn (Aviator747), whom was the only male in the group, Destiny Bellarose (Destiny0000), Diana266, and Mila Kowalski. They were seated at the moment, and invited me to sit with them. May described her introduction to Second Life aircraft , "I was introduced to it by a friend, and then trained by Diana and Pilot in a group called NAS (Naval Air Squadron)." Pilot stated, "I am a real-life pilot, so I enjoy anything to do with aviation." 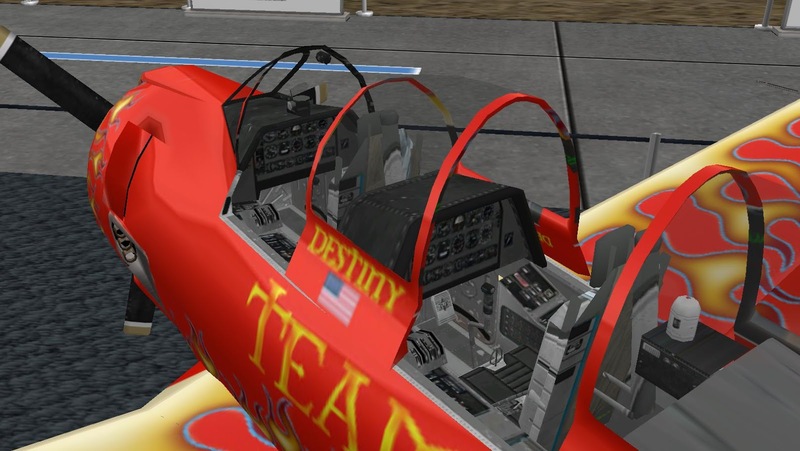 Destiny told, "I stumbled upon it all by accident and trained myself by trial and error until joining an aerobatic team about 3 years ago, and then really learning how to fly. My husband is an air show pilot in real life." Diana commented, "Dest is an airshow groupie." Destiny giggled, "Yes, I've been to them all over North America." Mila informed, "I am part from that group called NAS that May talked before." May mentioned the pilot who was absent, "We do have another pilot called Melody. She is away in real life for a while." Destiny went on, "I have partied with and flown next to the real-life Blue Angels. ... love flying in both worlds. I think it took me about a year of flying everyday to learn how to land and airplane on a runway. It is harder than it looks." Mila added, "Same here Des." 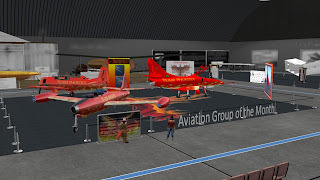 May stated of the group's purpose, "We do this to promote flying in Second Life, and because we love doing it. As Pilot says, it's amazing how many people don't know you can fly in Second Life. And when they see it, they are amazed." My response was, "That seems a bit odd to me, considering one of the first things one learns around here is pressing the 'fly' button." May answered me, "Yes, but not in planes. Most people never get to experience it as they are in clubs or on sims without flying." 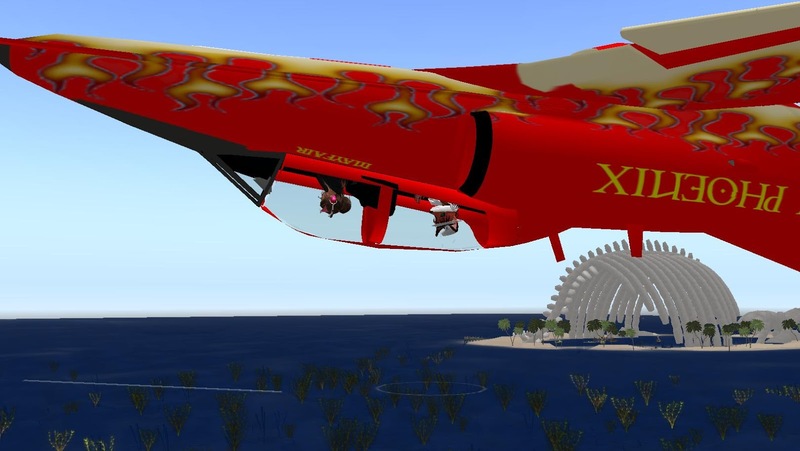 Pilot added, "I have talked to some people in sl that have been here a long time,and they had no idea you could fly a plane in Second Life." Eventually May suggested, "Ok, shall we take Bix for a flight?" The group went to five jets parked just outside the hangar. May invited me to get into the back seat of her jet, and they started the engines, "hold on to your hat." The planes then went down the runway, picking up speed, then taking off, raising the landing gear. To see around, I had to expand my draw distance, but lower the quality of what could be seen. 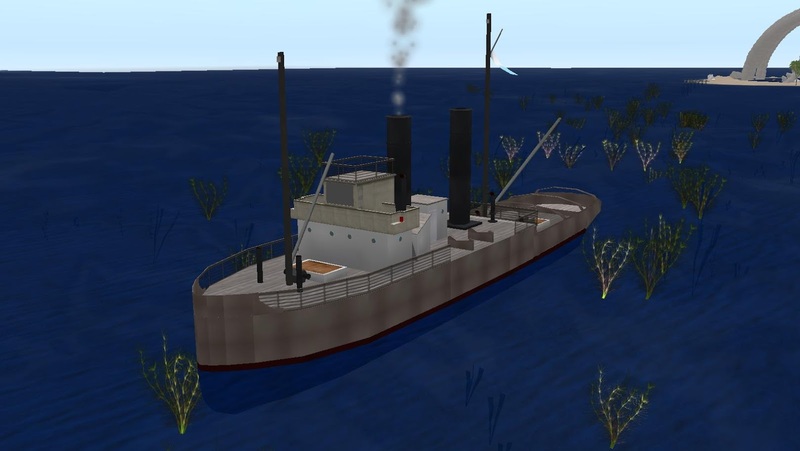 We were out over ocean, so that helped things rezz faster. Among the things I saw in the water was Ahab's Haunt, an island with a huge creature's skeleton that Gemma Cleanslate had written about years ago. I also saw that we weren't along in the air. Someone else was flying around these skies at the moment. 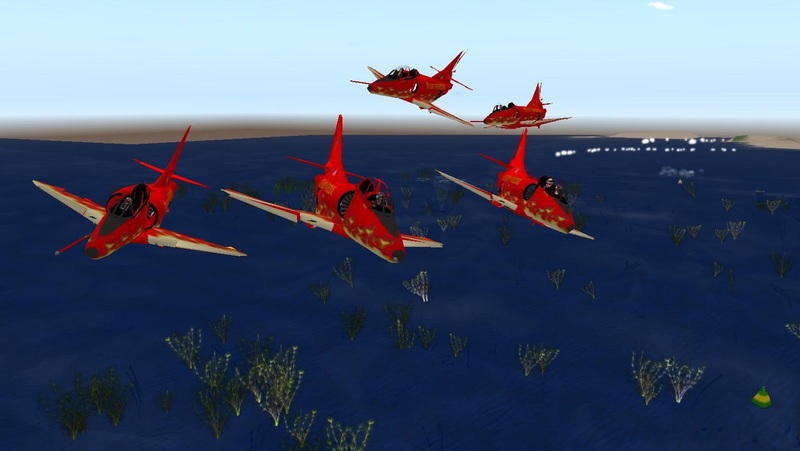 The squadron flew about, doing manuvers and going about in formation. They would loopin formation, fly stright up and seperate and reform, and other manuveres. It was quite a ride. Eventually, it was time to head back. So the squadron made a return course to the airport, made their approach to the runway, and touched down. Despite all of those sim crosings, no one had crashed. Thr group did feel one thing gave them some trouble, May saying, "That boat caused me a lot of problems with lag spikes." Diana explained, "Many of the older boats have lots of scripts and are high prims." Destiny felt the problem was something else, "I had too much eggnog last night. I thought my left hand was my right hand." I asked about boats and buildings in combat areas that are scripted to fall apart when having taken enough damage. May told me, "They can be bad if they fall apart when we are near them. But not so bad normally." Commenting about the variety of planes around, I asked if they had any favorite planes in aviation history. May answered, "Mine is definitely the Spitfire." Pilot added, "Mine is the P-51. "Destiny spoke, " My favorite is the Spitfire as well. Love their manuverability and the sound of that engine as the plane roars by you." Mila commented, "Mine is (the) Hell Diver I think." Of the planes' mechanics, Destiny commented, "We have a great fly script thanks to our plane's builder, Shana." Mila added, "Yes Shana is the best!" "She builds a great product for what we do." I asked about occasions in which things went hilariously wrong. May answered, "Well, we did a display, or tried to. But when we entered the sim, all but I crashed." Destiny chuckled, "Sometimes we get crazy and crash into each other and giggle to death. I had to edit out of a creek (on) the day May speaks of......I was soooooooooo embarrassed. The lag was insane that day." May stated, "Although we are serious fliers, we don't take ourselves seriously." Destiny added, "We are here to have fun, but, we have that professional side that requires commitment." May commented, "There would be a lot more shows if there wasn't so much rivalry amongst creators. ... Certain designers won't go to the same sim as others. A friend of ours tried to organize a huge show, and it got canceled because of (rivalry)." Destiny spoke, "I think that rivalries and egos are everywhere." May went on, "If designers would just accept that customers don't all want the same thing. It would be much easier. Some want realistic flight capabilities, and some don't." "Diversity is so necessary," Destiny commented. The talk returned to Shana again, May saying, "We publicly support her, and she has helped us as a group enormously." Destiny added, "Yes....and she tries to come to our shows and various events." It was about this time Pilot had to leave, before I had another question to ask, "With him being the only guy, I take it there's been some minor ribbing on occasion?" "No, not minor," May answered, "major." Destiny giggled, "He puts up with lots of girlie talk." May added, "but gives as good as he gets." I asked, "Any stories, or are the readers just asked to use their imaginations?" May stated, "I take the fifth on that." Destiny joked, "Well .... as an example, as we were taxing out today, he made some sound in his mic. And I simply asked him, 'Hey, Pi, get a hair caught in your zipper?' " The group chuckled. Destiny continued, "I harrass him like that all the time. He takes it all in fun." May stated, "We have all been friends for about two years now. So we know each other inside and out." 'We don't take ourselves too seriously," Destiny added, "and, we can be brutily honest when called upon." I did half-seriously ask if with the red coats of paint on the planes, were there any jokes about diving with the sun behind them. That led to a conversation about combat sims, and they reminding of their start in the NAS. It was about this time we went our seperate ways. May reminded, "We are here to entertain and hopefully raise money for the various charities." Destiny offered to answer any questions readers of the article might have. So if you're interested in Second Life aviation, this is one group of people who know plenty about it. And if you want an air group to perform at a charity event, they'll be more than happy to help. These experiences range from 3D games and contests, to interactive adventures where friends can take on new identities to imagine what it would be like to be a dinosaur, a miner in a quarry or an astronaut out in space.